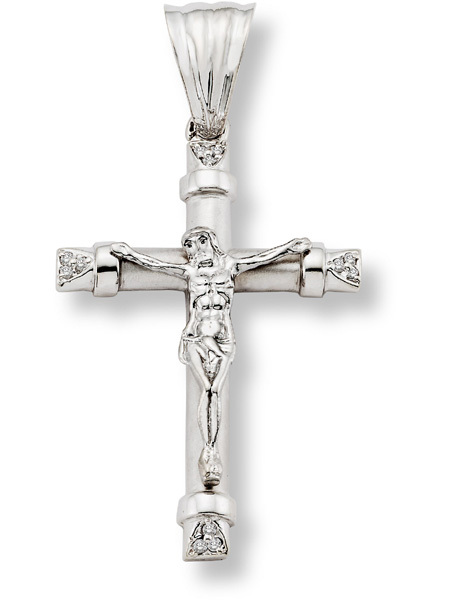 14K White Gold Crucifix Pendant. Beautifully depicts our Lord. High quality white gold and cz stone accents. Crucifix measures 1 3/4" tall x 1 1/8" wide. Pendant measures 2 3/16" tall with hoop/bail. Cross pendant weight: approx. 7.0 grams. We guarantee our 14K White Gold Crucifix Pendant to be high quality, authentic jewelry, as described above.